Dave Wolfenden spotlights these nifty alternatives to fluorescents. These lamps from Arcadia are the same shape as a T8 fluorescent tube, but the light is generated by a row of LEDs (36 in the smallest 600mm models). Five sizes are available, ranging from 600mm in length to 1,200mm. They fit straight into regular T8 lampholders and run off magnetic ballasts (they won’t work with electronic ballasts). This makes them a cheap way of pimping existing systems with T8 fluorescent gear to take advantage of the longer life and lower power usage of LED technology. Arcadia claims up to 70% more output compared to an equivalent fluorescent with around one third of the power use — happy days! The end caps look just like those of a normal fluorescent, and they actually swivel through 270° or so to allow for adjustment of the light’s direction. This could be essential where fixed lampholders are in place; it also allows for tweaks to the direction of output; for example, angling away from the front glass, which is a nice touch. Heat output is minimal. The upper half of the lamp is made of ridged satin metal. This acts as a heat sink, drawing heat away from the LEDs, but the lamp only gets slightly warm to the touch. This isn’t surprising when considering the low power draw of each lamp. The smallest tubes (600mm), for example, demand a mere 9W. The lamp itself is IP67 rated, so it’s fully waterproof and fully protected from dust ingression — making these perfect for installation within the humid confines of an aquarium hood. Four types of lamp are available: two for freshwater and two for marine applications. The Sunlight freshwater lamp claims a colour temperature of 8,000K, and it is clearly branded as a planted aquarium light. It gives the clean light that’s so in vogue in planted tank circles. Output isn’t retina-melting, with a maximum PAR of 33 at 200mm, but using multiple lamps should meet the needs of many plant species in shallow systems. With the lowest PAR rating of the range at 200mm depth (13PAR), the Tropical light generates a pinkish hue (think Grolux), but claims a colour temperature of 10,700K. It shows off the fish’s colours a treat, and it gives the aquarium a warm 'old school' tint. Marine white gives a crisp white light of approximately 12,000K and provides a good general-purpose marine light. Don’t expect to maintain demanding, light-hungry SPS corals with these, having a maximum output of 33PAR at 200mm water depth. To be fair, Arcadia doesn’t make any claims in that department; even so, I’d see these as mainly being suitable for fish only or FOWLR systems or for tanks with hardy low-light level species if you can factor in two or more lamps. They’d also be ideal for macroalgae refugiums. The Marine blue lamp really is blue. Measuring colour temperature is actually a bit of a grey area above 20,000K, but some manufacturers try and convey the 'blueness' of their lamps by assigning a figure, all the same. In this case, Arcadia describes the Marine Blue as '>25,000K'. It certainly gives a bright, penetrating light, which makes the fluorescent pigments in corals really pop. Use this to augment white marine lighting, for night-time viewing or to simulate deep water environments. Maximum claimed PAR at 200mm depth is 29. In use, all the lamps gave a good spread of light. I liked the fact that there’s no need to bother with reflectors. And yes, they do give a shimmer effect to the water, which is a huge plus compared to fluorescents. The effect is subtle, but it brings welcome vibrancy to the look of the aquarium. This allows for a much more dynamic effect, and for many, this should be a big selling point. They don’t ramp up and down in intensity or change their colour temperature, but that’s not really the point. If you’re after a practical and safe alternative to fluorescents, you may have just found it. 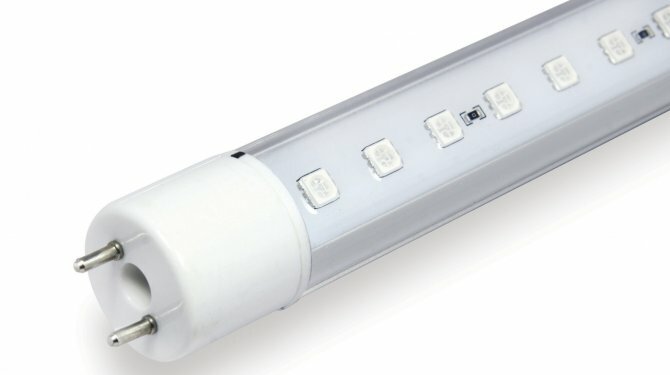 For those wishing to retrofit LEDs using existing T8 ballasts, or those simply looking for a cost-effective way of introducing this energy-efficient form of lighting, these lamps are worth looking into. They’re pricier than equivalent fluorescents, but they’ll more than pay for themselves in terms of lamp life and reduced power consumption. Price: RRPs range from £39.99 for the 600mm versions to £55.99 for the 1200mm lamps.